1. In a bowl, mix together the lemon zest and juice, rosemary and olive oil. Add the chicken and place in the fridge to marinate for 15 minutes. 2. Preheat the oven to 200°C, gas mark 6. Place the chicken and bread on a non-stick baking sheet. Bake for 15 minutes until the chicken is cooked through and no pink meat is visible and the bread is golden and crunchy. 3. Place the lettuce and cucumber in a large serving bowl. Cut the chicken into bite-sized pieces and scatter over the lettuce with the croutons, salad onions and the parmigiano reggiano. 4. Drizzle over the dressing and finish with a grinding of coarsely ground black pepper. 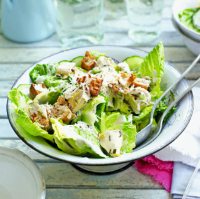 You can make a super speedy version of this recipe using Waitrose British roast chicken lemon & herb pieces and Waitrose multigrain croutons.